The past and the present come together in this showcase of tributes to the world’s greatest entertainers. And with all the choices available, it’s easy to create the mix that suits your taste and budget. Whatever combination you put together, first and foremost is the most authentic tribute performances of music and comedy by America’s finest lookalikes and impersonators. And that’s enhanced with elements of audience interaction that draws the crowd in and keeps them engaged and involved from start to finish. 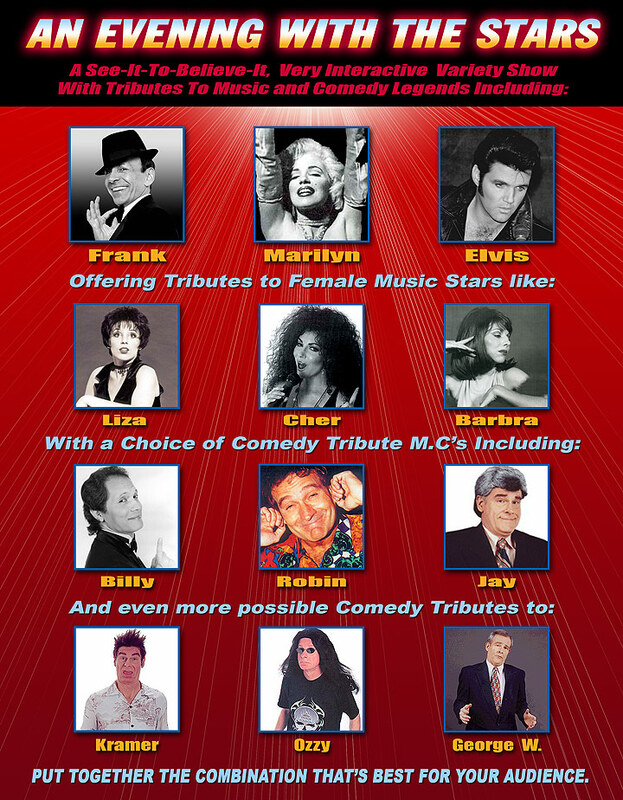 From the moment the first tribute performer takes the stage, till the grand finale, the audience at your venue or event will truly feel like they have experienced An Evening With The Stars.